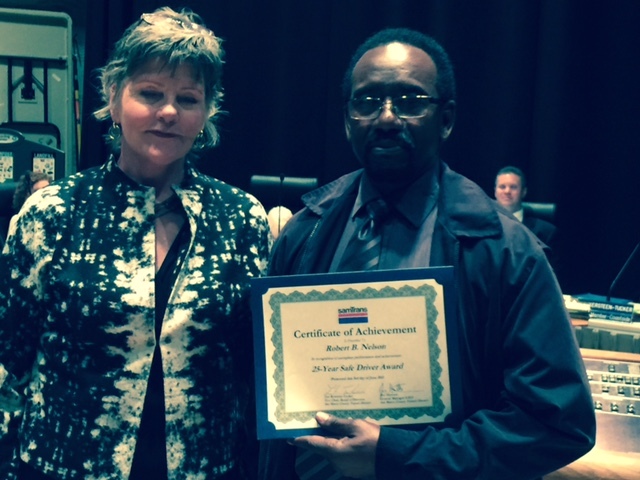 SamTrans awards 25-year safe maintenance worker and bus operators – Peninsula Moves! This blog post is the second of a three-part series highlighting bus operators and maintenance workers who have 20 to 30 years of perfect on the job safety records. 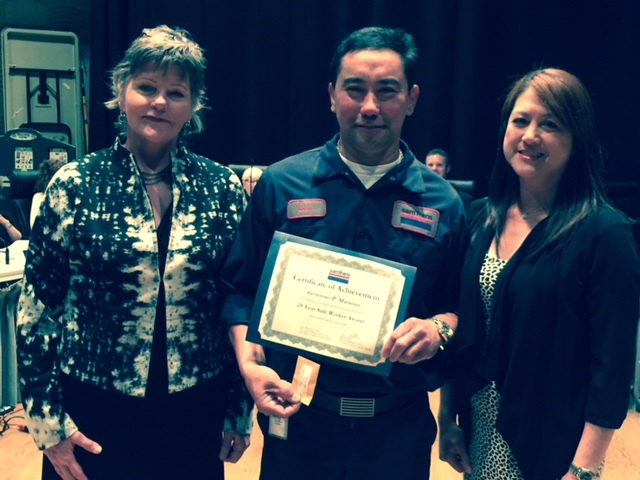 Mechanic Generoso Maranan poses with SamTrans board member Zoe Kersteen-Tucker and a family member. Mechanic Generoso Maranan may not interact with customers on a day-to-day basis, but he certainly cares about getting them to and from their destinations. 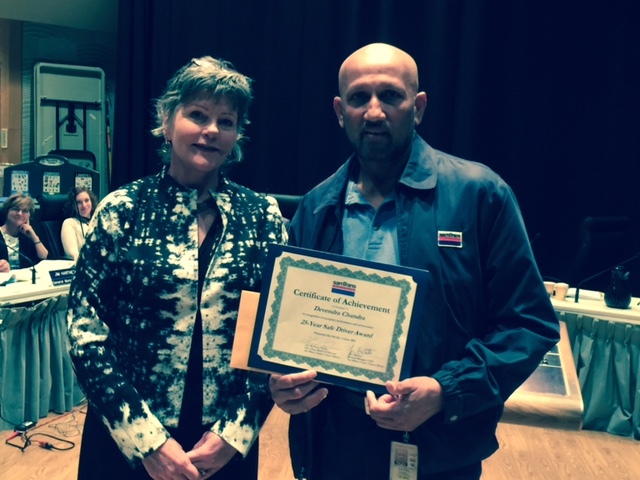 Maranan was honored by the SamTrans Board of Directors earlier this month for earning his 25-year Safe Worker Award from the National Safety Council. Maranan said he reached this major milestone by always following safety procedures, watching other employees being safe and by being organized. Since November 1992, Maranan has received Employee of the Month nine times and was voted a Maintenance Employee of the Year in 2003. When he’s not fixing SamTrans buses, Maranan enjoys spending time with his new grandson and taking his wife shopping. As part of this latest honor, Maranan received a certificate of appreciation, a lapel pin for his uniform and a special gift in recognition of his achievement. SamTrans bus operator Devendra Chandra snaps a photo with board member Zoe Kersteen-Tucker. Bus Operator Devendra Chandra and Bus Trainer Robert Nelson, who was recently promoted from bus operator to trainer, also earned their 25-year Safe Driver Awards from the National Safety Council and were recognized by the Board. Chandra, who was selected as Operator of the Month three times and chosen as Operator of the Year in 2005, had some advice for the newcomers at SamTrans. When Chandra is not working, he enjoys cooking, watching sports and working on home improvement projects. Nelson, who started working for SamTrans as a bus operator in 1981, said he earned his 25 years of safe driving by setting goals for himself from day one in revenue service to go two years free of preventable accidents in order to get the pay merit increase. After that, he just continued to set goals to try to go as many years as he could without a preventable accident. Operator Robert Nelson poses with board member Zoe Kersteen-Tucker. When he’s not working, Nelson loves spending time with family and friends, and taking rides on his motorcycle. Each bus operator received a certificate of appreciation, a badge and a lapel pin for their uniforms, and a special gift selected for their achievement.